IQS Directory is a top industrial directory listing of leading industrial thru-bolt manufacturers and suppliers. Access our comprehensive index to review and source thru-bolt manufacturers with preview ads and detailed product descriptions. These thru-bolt companies can design, engineer and manufacture thru-bolts to your specifications and application need. A quick and easy to use request for quote form is provided for you to contact these thru-bolt manufacturers and suppliers. Each company has detailed profile information, locations, phone number, website links, product videos and product information defined. Read customer reviews and product specific news articles. We are the right resource for your information requirement whether it's for a manufacturer of anchor bolts, shoulder bolts, or stud bolts. Ford Fasteners offers some of the best parts, prices and delivery in the industry with great service and made-to-order capabilities. Ford’s vast inventory of thru-bolts and other long lasting products has secured our position as an industry leader for years to come. For more information and a full product listing, visit our website or call today! Ken Forging has manufacturing experience dating back to 1970 and over the years we have grown into an international supplier of all kinds of bolts. Our teams are committed to providing our customers with the best products possible and we offer quick turnaround on all orders. Our completely integrated in-house tooling systems allow us to meet all of your custom specs quickly and efficiently. Serving construction & industrial needs for 30 years, Knapp is a master distributor & importer virtually every type of bolt, screw, washer, and nut you can think of. We are your complete source, even doing custom manufacturing when unique specifications are required. This diversity provides our customers with a strategic advantage; certified quality, superior service and fast delivery. Thru-bolts can be defined as bolts that pass completely through a layer, and bind by way of a nut on the layer’s other side. Thru-bolts are the strongest and most reliable of all types of bolts, making them the bolt of choice for the most heavy-duty of applications. They are able to withstand a large amount of weight, and alleviate any safety concerns an application may have. Applications in which thru-bolts are utilized span a multitude of industries, and include rolling shutters, security grills, sun awnings, and garage doors. 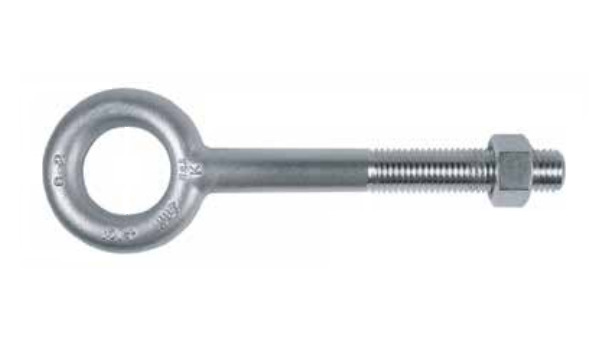 Since thru-bolts are durable and strong, they are recommended for use whenever possible. For example, when building a deck, it is recommended to use thru-bolts on railing posts and deck ledgers, and more specifically, at connections where ledgers attach to posts or the building itself. In general, bolts can be made from a wide range of metals, which include stainless steel, aluminum, brass, copper, bronze, nickel alloys, and titanium. On the other hand, materials such as cast iron, silicon, tungsten, cobalt and its alloys, rhodium, and rhenium, are too brittle. 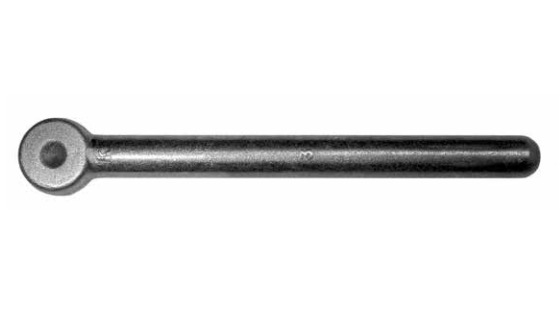 The manufacturing process for a bolt is similar to that of other fasteners. The first step of the process involves heating a metal rod, cleaning it with sulfuric acid, and applying a coating to prevent rusting. The next step involves a method known as cold forming, also known as cold heading. In the cold forming method, the metal rod is formed and shaped at room temperature and at high pressure. The final touches are applied by forcing the metal rod through at least one die and then cut to the desired length. The cold forming method is highly advantageous to other methods such as machining when it comes to manufacturing thru-bolts. Cold forming is a highly flexible method. Parts can be hit multiple times, and can either be moved through one die or transferred through a series of dies that progressively shape the rod into a complex configuration. Because of the variety of ways that the cold forming process can be modified, the range of shapes that can be formed is remarkably broad. Bolts that are cold formed can feature different shaped heads, threads, grooves, knurls, and tapers, depending on the application and the desire of the manufacturer. In the long run, cold forming reduces scrap and allows manufacturers to save more material. It also helps to save material due to the high speed of the process. As opposed to screw machining which involves the interruption of grain flow, the cold forming process rearranges the grain structure of the bolt, thus increasing the shear strength performance of the final product. You will wind up with bolts that are consistent, of high quality, and with a smooth surface finish. In turn, there is no need for the bolts to undergo any type of secondary finishing. Finally, the cold forming process allows the manufacturer to convert multi-part units into a singular component if they so choose, which can potentially help a company save on inspection, labor, tolerance issues, purchases, inventory coordination, and assembly time. Thru-bolts are greater in size and thickness compared to other types of bolts because of the amount of weight they are expected to handle. Many applications require the lifting of heavy loads, and need the proper amount of support. Since there may be safety risks that come with choosing the incorrect thru-bolt for your intended application, the thickness and length of the bolt are important factors to consider. The thicker the bolt, the more weight the bolt will be able to withstand, and the less likely the bolt will break or snap. The length of the bolt must also be long enough to pass through a layer or material and be secured on the other side by a nut. Finding a reliable, experienced thru-bolt manufacturer will ensure that you receive a thru-bolt that best fits your application. Before meeting with the manufacturer, it is important that you know the specifications of your application thoroughly. A seasoned manufacturer will be able to assist you in finding the best possible thru-bolt if they know as much detail about your situation as possible. Knowing you have a thru-bolt that perfectly suits your needs and will provide reliable support will bring you peace of mind in the applications for which the bolts will be used.